The Mega-Pro™ Swinging Door from Curtron is ideal for drive-in cooler or freezer applications where easy access and temperature control are needed. Constructed of .160" thick PVC material, mounted on a stainless steel self-closing hinge, the Mega-Pro™ comes completely assembled for easy installation. 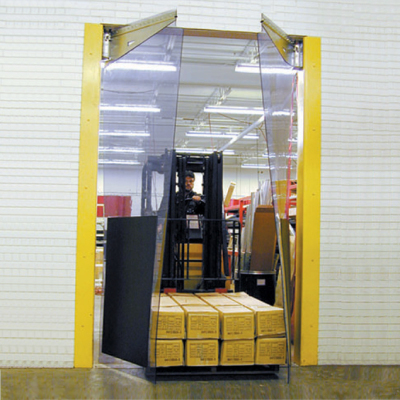 These doors are an excellent alternative to vinyl strip doors for material handling applications. The PVC panels are transparent. For high traffic applications, black flexible impact plates can be heat-sealed to the panels.